غفاری, علی. (1395). استفاده از روش کدگذاری شبکه در مسیریابی شبکه های حسگر بی سیم. 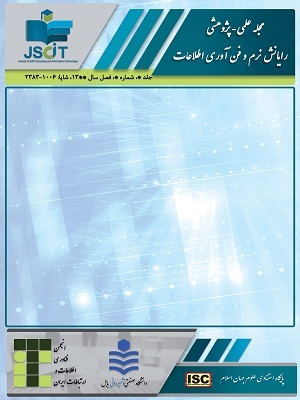 مجله علمی-پژوهشی رایانش نرم و فناوری اطلاعات, 5(2), 12-18. علی غفاری. "استفاده از روش کدگذاری شبکه در مسیریابی شبکه های حسگر بی سیم". مجله علمی-پژوهشی رایانش نرم و فناوری اطلاعات, 5, 2, 1395, 12-18. غفاری, علی. (1395). 'استفاده از روش کدگذاری شبکه در مسیریابی شبکه های حسگر بی سیم', مجله علمی-پژوهشی رایانش نرم و فناوری اطلاعات, 5(2), pp. 12-18. غفاری, علی. استفاده از روش کدگذاری شبکه در مسیریابی شبکه های حسگر بی سیم. مجله علمی-پژوهشی رایانش نرم و فناوری اطلاعات, 1395; 5(2): 12-18. محدودیت انرژی در شبکه­ های حسگر بی­سیم، مسیریابی بسته­ ها را با چالش­های اساسی روبرو کرده است. در کاربردهای مبتنی بر رخداد، محدودیت­های ذاتی این شبکه­ها باعث شده است که بر اثر ترافیک بیش از حد بسته­ها، گره­های حسگر نزدیک چاهک انرژی خود را تخلیه نمایند. در اثر این تخلیه ماموریت شبکه با مشکل اساسی روبرو خواهد شد. روش کدگذاری شبکه با کدگذاری و کدگشایی بسته­های داده، گذردهی شبکه را بهبود داده، تاخیر انتها به انتها را کاهش داده و شبکه را در برابر برخی خطاها مقاوم می­نماید. در این مقاله یک الگوریتم مسیریابی با استفاده از کدگذاری شبکه ارائه شده است. در روش پیشنهادی برای تعیین مسیرها، پارامترهای کیفیت پیوند ارتباطی و انرژی موجود همسایه­ها را در نظر گرفته و علاوه بر آن برای ارسال اطلاعات از کدینگ شبکه استفاده می­شود. نتایج شبیه­سازی نشان می­دهد که روش پیشنهادی در مقایسه با روش دیگر، قابلیت اطمینان را افزایش و انرژی مصرفی را کاهش می­دهد. I. F. Akyildiz, W. Su, Y. Sankarasubramaniam, and E. Cayirci, "Wireless sensor networks: a survey," Computer networks, vol. 38, pp. 393-422, 2002. J. Yick, B. Mukherjee, and D. Ghosal, "Wireless sensor network survey," Computer networks, vol. 52, pp. 2292-2330, 2008. A. Ghaffari, "Congestion control mechanisms in wireless sensor networks: A survey," Journal of network and computer applications, vol. 52, pp. 101-115, 2015. A. Ghaffari and V. A. Takanloo, "QoS-based routing protocol with load balancing for wireless multimedia sensor networks using genetic algorithm," World Appl. Sci. J, vol. 15, pp. 1659-1666, 2011. R. R. Rout and S. K. Ghosh, "Enhancement of lifetime using duty cycle and network coding in wireless sensor networks," IEEE Transactions on Wireless Communications, vol. 12, pp. 656-667, 2013. X. Wang, J. Wang, and Y. Xu, "Data dissemination in wireless sensor networks with network coding," EURASIP Journal on Wireless Communications and Networking, vol. 2010, p. 465915, 2010. A. Ghaffari and L. Azari, "Proposing a novel method based on network-coding for optimizing error recovery in wireless sensor networks," Indian Journal of Science and Technology, vol. 8, p. 859, 2015. R. Mohammadi and A. Ghaffari, "Optimizing reliability through network coding in wireless multimedia sensor networks," Indian Journal of Science and Technology, vol. 8, p. 834, 2015. A. Ghaffari and A. Rahmani, "Fault tolerant model for data dissemination in wireless sensor networks," in Information Technology, 2008. ITSim 2008. International Symposium on, 2008, pp. 1-8. M. Z. Farooqi, S. M. Tabassum, M. H. Rehmani, and Y. Saleem, "A survey on network coding: From traditional wireless networks to emerging cognitive radio networks," Journal of Network and Computer Applications, vol. 46, pp. 166-181, 2014. S.-Y. Li, R. W. Yeung, and N. Cai, "Linear network coding," IEEE transactions on information theory, vol. 49, pp. 371-381, 2003. Z. Wei, T. Zhenmin, Y. Yuwang, and W. Lei, "Network Coding Based Reliable Multi-path Routing in Wireless Sensor Network," Indonesian Journal of Electrical Engineering and Computer Science, vol. 11, pp. 7754-7761, 2013. Y.-W. Yang, L. Gu, Y.-T. Ju, Y. Zheng, Y.-M. Su, and J.-Y. Yang, "Reliable braided multipath routing with network coding for underwater sensor networks," China Ocean Engineering, vol. 24, pp. 565-574, 2010. Y. Yang, C. Zhong, Y. Sun, and J. Yang, "Network coding based reliable disjoint and braided multipath routing for sensor networks," Journal of Network and Computer Applications, vol. 33, pp. 422-432, 2010. K. Sha, J. Gehlot, and R. Greve, "Multipath routing techniques in wireless sensor networks: A survey," Wireless personal communications, pp. 1-23, 2013. L. Wang, Y. Yang, and W. Zhao, "Network coding-based multipath routing for energy efficiency in wireless sensor networks," EURASIP Journal on Wireless Communications and Networking, vol. 2012, p. 115, 2012. M. Radi, B. Dezfouli, S. A. Razak, and K. A. Bakar, "LIEMRO: a Low-Interference energy-efficient multipath routing protocol for improving QoS in event-based wireless sensor networks," in Sensor Technologies and Applications (SENSORCOMM), 2010 Fourth International Conference on, 2010, pp. 551-557. Q. Tuanfa, L. Jianzhong, T. Zhenhua, and L. Jiafeng, "An Energy-Efficient Network Coded Cooperation Scheme in Wireless Sensor Networks," China Communications, vol. 8, pp. 166-172, 2011. L. Shan-Shan, Z. Pei-Dong, L. Xiang-Ke, C. Wei-Fang, and P. Shao-Liang, "Energy efficient multipath routing using network coding in wireless sensor networks," in International Conference on Ad-Hoc Networks and Wireless, 2006, pp. 114-127. M. Handy, M. Haase, and D. Timmermann, "Low energy adaptive clustering hierarchy with deterministic cluster-head selection," in Mobile and Wireless Communications Network, 2002. 4th International Workshop on, 2002, pp. 368-372.